These huts are available for hire by the day and are complete with an electrical plug socket, internal lighting, a cupboard and two chairs making them an ideal base for up to six people. 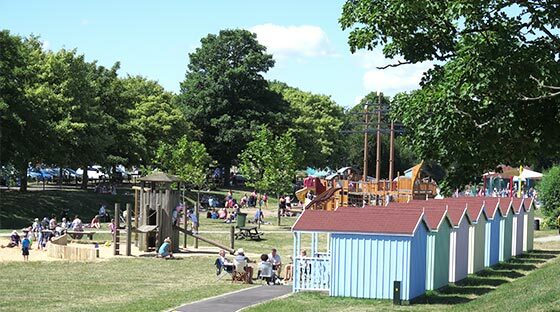 Gold Package available during peak times for £60 including beach hut hire, 2 Gold Splash Park wrist bands which allow unlimited use for one person each plus all day parking in the park for one car. Further Gold wrist bands are available at £12.50 each. Free entry to the Museum in the Park for children and 50% for adults. This promotion can be used on any day not just the booked day as the museum has only certain days of opening. Contact the TIC for full details. On the day, if there are any huts available they can be booked with the Splash Park team (in season). Please note: The beach huts are located within an area at risk of coastal flooding. You will be advised of any expected high tides at the time of booking but you should also check the weather forecast on the day of hire and read the Flood Risk Assessment sign within the beach hut. Beach huts will only be hired to adults on the provision of a full UK postal address and after payment in full has been received. This booking is not transferable to any other person. Cancellation with less than 72 hrs notice will incur a £10 cancellation charge per day per hut. Hire begins at 10.30am and terminates at 9pm or 30 minutes before dusk,whichever is earlier. Confirmation of your booking will be via e-ticket which should be shown at the Pirates Bay Adventure Golf kiosk to obtain your individual key for the day. Keys must be returned to the kiosk at the end of your stay via the drop box. A £10 charge will be incurred for lost keys. Valuables should not be stored in the beach hut. The Council cannot be held responsible for any loss or damage to the hirer’s property. All litter and personal belongings must be removed from the beach hut upon departure and the hut left clean, tidy and secure. Any items left behind after hire will be kept for 14 days before being disposed of. In the event that you do leave something behind please call the parks team on 01621 857073. Beach huts must only be used during the hours of daylight and must not be used for overnight accommodation. No pets or other animals (except assistance dogs) are permitted in the beach huts or within the fenced play area. The beach huts are to be used only as shelter and for storage of personal items for day visitors to Promenade Park and for no other purpose whatsoever, unless permission is granted by Maldon District Council. Please be considerate of neighbouring beach hut hirers and other park users. Persons engaged in inappropriate or anti-social behaviour may be asked to leave and no refunds will be offered. Smoking or other naked flames are not permitted within the beach huts. No barbecues or fires are permitted in the fenced play area. There is a maximum number of 6 people including babies and children allowed in the huts at any time either inside or outside. The Council reserves the right to cancel a booking at short notice should there be circumstances outside of our control, eg damage to the hut. Should this occur, every effort will be made to accommodate the booking or a full refund will be issued to the hirer. The beach hut will be inspected by a Council employee at the end of each hire and records will be made of any loss or damage incurred. The hirer will be responsible for the costs of making good any loss or damage to Council property and/or equipment during the hire period.